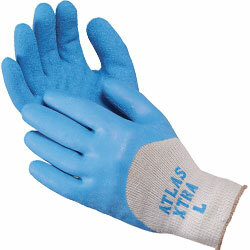 Atlas 305 String Knit Coated Gloves. Latex-coated on front and ventilated across the back to keep hands cool. Built for superior durability and knuckle protection without sacrificing comfort or ease of movement. Provides strong, superior grip on wet or dry surfaces or items.